ABB, a company that specializes in electric vehicle power solutions, recently announced plans to build the world’s largest nationwide network of EV fast-charging stations in the Netherlands. Working in collaboration with Dutch startup Fastned, ABB will install more than 200 stations along Dutch highways over the next 3 years. 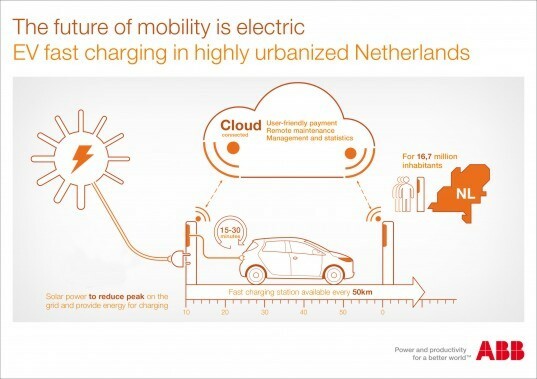 When completed, ABB claims that none of the country’s 16.7 million inhabitants will be more than 31 miles away from the nearest EV charging station. Every day more automakers announce plans to add electric vehicles to their line-up – however we’re still a long way from an EV revolution. Experts say that a big obstacle to the uptake of electric cars is range anxiety: the fear that there aren’t enough charging stations to accommodate long-distance trips. The infrastructure can’t be built in a couple of days – but ABB and Fastned are hoping it can be built in a couple of years. The first ABB Terra fast chargers are due to be delivered in September 2013. 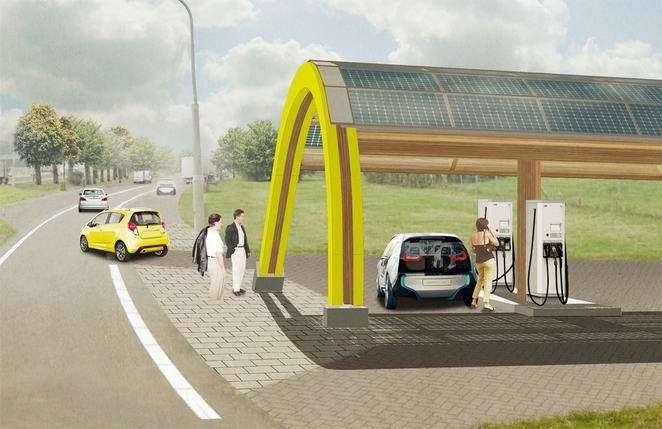 Construction of the Fastned stations, which will have solar canopies, is expected to be completed by 2015. When finished, the Netherlands will officially be the most populous country to roll out a nationwide fast-charging network. I only wish that were true here in America where the trend is to remove all incentives, especially financial at the state level, when it comes to electric vehicles. How will this stack up against the fast charge system Tesla is rolling out in about the same time that will enable drivers to cross the country by early 2015 with most of the country being done by this time next summer? Either way this is wonderful news because the world needs more charging stations in order to help those with "range anxiety" to adopt electric cars. Just seeing them on the road more often here in the States gives me hope.Great story. Hi, thanks for covering this important development about bringing 16 mio Dutch within prxomity of a fast charger. While we are proud of our tehcnology for electric vehicles, ABB is also active in areas like renewables, smart grid or robotics. This is great. Hopefully similar companies/governments will do the same across Europe.